This up-coming migration period, try getting out birding with birders with more field experience and mention ahead of time that you’re looking to work on (enter bird group name, i.e., shorebirds or fall warblers) and call some of the ID’s, but would prefer to have them vetted for accuracy afterwards. Recalling my early days in the field, I was blessed to bird with mega-talents. Each one of them had mythical qualities: vast knowledge base from many years of field experience, a history of finding/correctly identifying rare and vagrant birds, a squeaky-clean reputation with very few noteworthy field blunders, and no apparent dishonesty in the field. It took me a long while before I could even speak about birds around them, let alone speak with authority! Little did I know at the time, a vital sifting and grinding process occurred. Never did it feel particularly good (tripping over ID’s and getting called on it (in a friendly, constructive way); racing to conclusions in an excited state, then back-peddling, then racing forward again…then getting called on it; and, the most painful: providing an explanation for an ID call and having the ear of an expert tilted in, listening intently!) but these were significant steps to developing a real sense of authority in the field. For example, in late April of 2013, while birding in Prince Edward Co., I asked my highly-skilled birding partner to not go easy on me, and I would see how well I would fare. I rated the day 75/25 in his favour but I still snuck a few solid ID calls in. I went home that evening with a smile on my face and thought “I got a few good ones in on ‘im!” It’s in those moments that I began to develop confidence in the field and, at the time, what was a distant, flickering light of authority. I guess what I’m getting at is, in my development as a birder, the act of frequently toeing the line in the presence of experts was equally important to just being around them, soaking in their vast, personalized field knowledge. I always kept an open mind, held no prejudice over my identifications, and took blows right on the chin. There were only a handful of times where I internalized an identification correction. I went home, sat down and sulked. Thankfully, I always seemed to snap out of it quickly, and get back to studying reference material. So, why not start with fall warblers? ;). Like any good student, study, study, study now before the big test in only 4-5 weeks’ time. 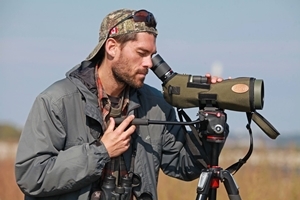 If you’re shy, the field lessons are all the more potent in their ability to ‘transform’ your abilities, so get out there and raise your birding game! Photo: A first basic (first year) female Blackburnian Warbler. Britannia C.A., Ottawa. 22 August 2014.